When I met Garibaldi Rous, he was already 10 months old and had just come to live with Melanie. In fact, Melanie and I had never met, but she asked me to come along as Assistant Capybara Wrangler to Gari’s first veterinary checkup. 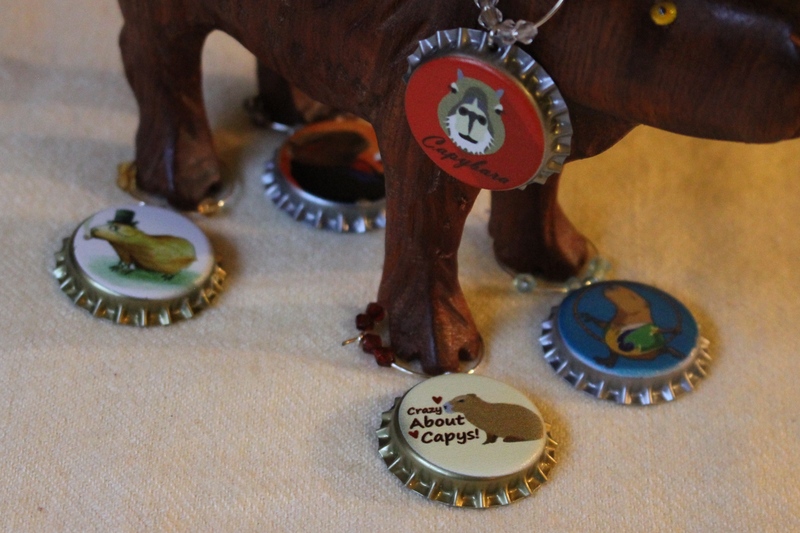 He was a gentle capybara, but still surprised to find himself in Texas. When dealing with wild animals, it makes a lot of sense to have extra hands available. Everything was new to Gari: swimming, green food, even the sky was a new and wondrous experience! Gari became the center of all attention. Gari did arrive fully capable of receiving affection, though. Gari was small, though. At 10 months, he weighed only 45 pounds, compared to wild capybaras averaging 57, Dobbye’s 60, and Caplin’s 67 pounds. His hind legs were not right, his hocks nearly touching as he walked. Gari was always hungry. Unlike older fussier capybaras, he would eat all kinds of fruit and vegetables, and was especially fond of the timothy hay seed heads. He didn’t know how to graze, though. Like most capybaras, Gari also loved corn. Like Dobbye, he ate it husks and all! When I think of Gari, now, I think of him on the window seat by Melanie’s side. Gari with some of my rodent friends. Gari and I became acquainted in the days before our big trip. Melanie and I got to know each other, too. Gari wasn’t allowed in the guest room, so he spent some time checking it out. Or maybe he was checking me out. The day of our journey to Texas A&M for Gari’s vet visit arrived. Chief Wrangler Sheldon rode with Gari in the back, Melanie drove, and I rode shotgun. Gari was very nervous during the 2 hour drive. Pilot and Photographer, Melanie Typaldos. We stopped often to give Gari a break, and Melanie took lots of photos. Gari is sedated and examined. He looked just fine, other than the oddly formed rear legs, for which there was no explanation. Chief Wrangler Sheldon, left; Dr. Sharman Hoppes, center; Garibaldi Rous, center foreground. Gari observes the new surroundings after coming out of sedation. So we loaded him back into the car and drove him home. Where he promptly hid in his pond, actually an iris-overgrown capybara safe-house! Garibaldi Rous died one week ago. This was the first of my four visits with him. Gari, like Caplin before him, seemed to have absolutely wonderful lives with Melanie. They just left way too soon, and will really be missed. Thank you for sharing your memories, Dobbye. I was planning on going to visit Gari and Mel this coming spring. I looked so forward to kissing that sweet nose and listen to him make those cute chirping sounds. Melanie let me listen to him over the phone and it was so cute. I miss that handsome loveable Gari.